We’re living in antagonistic times: our country is incredibly divided. In the short term, I don’t see things getting better. In the long run, though, periods of turmoil can spur introspection and eventual growth, with artists usually leading the way for the rest of us. Films, in particular, help us examine our cultural struggles and sometimes even provide guidance. A great example of this is 20th Century Fox’s release of Vanishing Point in 1971 on the heels of the Vietnam War, Watergate, and Altamont. 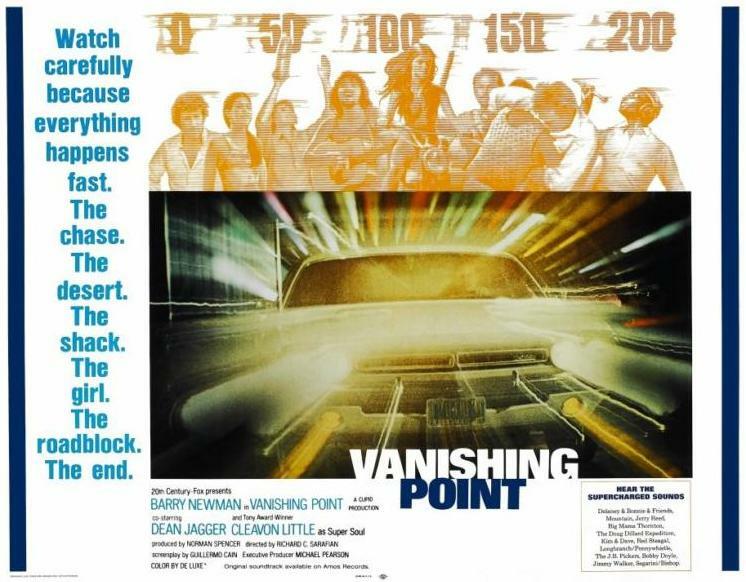 Original lobby poster for Vanishing Point. Barry Newman plays Kowalski, a car delivery driver who takes on his dealer’s bet that he can’t get from Colorado to San Francisco by tomorrow. He hits the road in a 1970 Dodge Challenger R/T 440 Magnum. (I’m not a car guy at all, but this is a sweet looking ride. Tarantino pays tribute to this film and the car in 2007’s Death Proof). 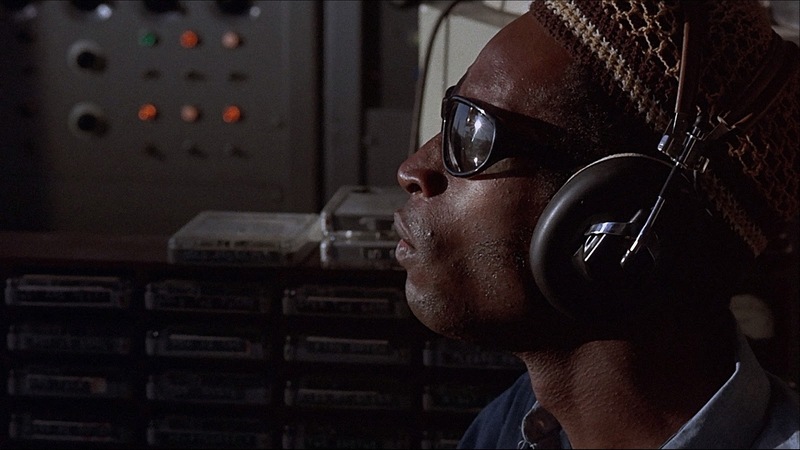 He ends up running afoul of the law but also developing a fan base thanks to a small-time DJ, Super Soul (Cleavon Little), who tells his listeners about this man who’s on a quest. Kowalski increasingly captures his audience: more and more people turn up to find out how the story will end. Chase scenes abound in this film. How does one outrun a helicopter? In addition to being a social commentary, this is a road trip movie. 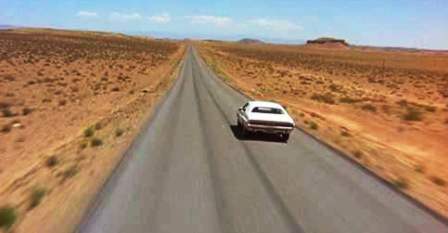 Filmed in Colorado, Utah, and Nevada, Vanishing Point captures the openness of the West, which is the perfect backdrop for the fun stunts. 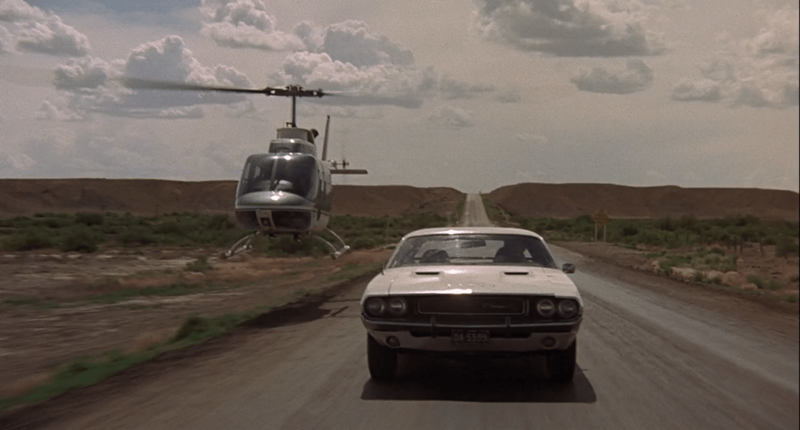 The director, Richard C. Sarafian, helps the audience feel the vehicles’ speed: with Cinematographer John Alonzo, he mounted cameras directly onto the vehicles (instead of the standard practice of having the camera towed or pushed on a separate vehicle). You can feel Kowalski trying to outrun his past and avoid thinking about the future. He’s strictly in the present. 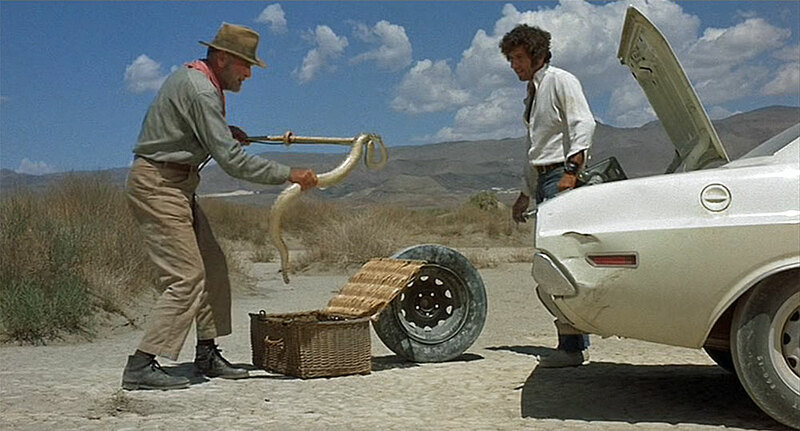 Kowalski runs into a wide range of people, including an old prospector who collects snakes for a commune, residents of said commune, a hippie biker and his naked bike-riding girlfriend, and—in the British release of the film (the version I would recommend)—an ethereal hitchhiker played by Charlotte Rampling. Each interaction shows in a new way how lost Kowalski is and represents different aspects of 1970s America. The old prospector has seen the world pass him by. The commune feels like a religion going through the motions but still trying to find God. The motorcyclists seem almost comfortable with their place in the world, having accepted their fate and the end of the hippie movement. I’ll leave it to others to determine what Rampling’s hitchhiker represents, but she seems as otherworldly as Death does in Bergman’s The Seventh Seal. In fact, there are many similarities between these two films. For example, both main characters encounter allegorical characters while running from (or to) death. This hitchhiker has waited a long time for Kowalski. Super Soul, the radio DJ, is the Greek chorus of the film, commenting on what is happening and playing a small role. We see certain scenes in which it seems like the two characters are having a conversation when, in fact, they are just on the same wavelength. At one point, racists break into the studio and beat up Super Soul and his engineer. Afterward, Super Soul (seriously, this is a fun name to keep typing) comes back on the air to prove that though his station is in ruins, he will keep the vinyl spinning. This gives the film a pro-civil rights feel. But there’s also an awkward scene in which Kowalski picks up two newlywed gay hitchhikers who decide to mug him. It’s the only moment that may ring false to a modern audience. Why include this scene? Maybe it’s to show Kowalski being scared of and unprepared for the future. It’s the only moment I can’t reconcile. Super Soul in his super studio. Super Soul—through on-air subtext—reveals that the police are planning to entrap Kowalski. As the dramatic conclusion unfolds, we focus on that vanishing point on the horizon line. Does Kowalski rush to his death, or does he make his escape through the still-visible vanishing point? In any case, the film shows that even though we go through troubling times, we do eventually move on. Heading toward the vanishing point (goodbye, 2016).